Windows add light, life, and character to a home. Vinyl siding can make your home look like new again, and save you money on energy costs. A sunroom brings the beauty and comfort of nature inside your home. Your entry door is the focal point of your home...the right door says, "Welcome, come inside." Listen To Our Latest Television Spot! 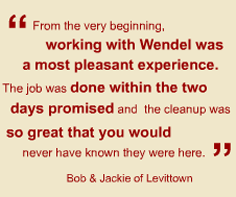 As a family owned business founded in 1953 by Bill Ritter Sr. and his partner Sal on the principles of quality materials and workmanship, along with over a half century of history behind its name, it comes as no surprise that Wendel Home Center has sustained its popularity. In 1997, the business operations were taken over by Bill’s sons’ Bill and Bob who have continued to address the needs of their customers while expanding their product lines to suit today’s marketplace. Wendel Home Center continues to enjoy a tremendous following of repeat customers who refer us to their family and friends because our solid reputation has been built around offering a diverse selection of top-of-the-line products, quality installations and remarkably competitive pricing. This is a true testimony of our integrity and personal commitment to our customers. Besides family that works at our company, our success has been attributed to our loyal and hardworking employees who have been with our company for many years. We offer a comprehensive line of Siding, Windows, Roofing, Entry Doors, Storm Doors, Patio Doors, Garage Doors, Sunrooms, Screen Rooms, Patio Enclosures, Florian Glass Solariums, Carports, Porticos, Aluminum Awnings, Insulated Roofs and Retractable Fabric Awnings. In addition to quality merchandise and competitive prices, customers will find a friendly, informative and no-pressure sales approach to complete the package. Our goal is to provide our customers with the knowledge necessary to make informed decisions about their home. “We service our customers like few businesses today do and truly want to offer them the products best suited for their particular needs.” say owners Bill and Bob. If your home has been affected by storm damage, we'll work closely with your insurance company to assist with your claim. Now more than ever, it's important to work with a company that's RELIABLE, TRUSTWORTHY & COMMITTED TO THEIR CUSTOMERS. Our newly remodeled Mineola showroom has been designed to assist our customers in all of their home improvement decisions. Stop in today to view our diverse line of energy efficient products on display. 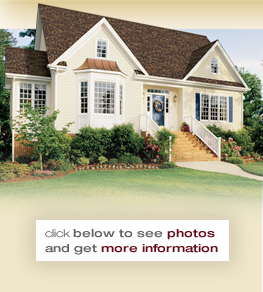 We offer Computer Design Imaging for your siding, roofing and entry door renovation. See how your home will look before the job begins! Our Mineola Showroom is open Monday - Friday 9am- 6pm, Saturday 9am – 5pm and Sunday 12pm - 4pm. We also provide FREE in-home estimates for your convenience. For customers looking to have their home improvement projects financed, Wendel has financing options available through the Home Projects ® credit card program issued by Wells Fargo Financial National Bank. APPLY TODAY at Wellls Fargo Financial National Bank directly through our website. Energy efficiency is more important than ever, and Wendel Home Center is committed to providing you with professional quality, energy efficient products so that you can save money, protect the environment, and stay comfortable all year. Our showroom features exceptional energy-smart and weather tight products that not only reduce fuel consumption needed to heat and cool homes; they also have a long service life and achieve optimal material use and minimal waste in production. Designed for superior thermal performance, products with Energy Star® qualified insulated glass packages can help reduce energy costs year round and further reduce consumption of fossil fuels. From the initial stages of purchasing your home improvement products to the actual installation, Wendel Home Center is with you every step of the way to assure you have quality performance products that not only save you money but stay true for years to come.